Since 1990, the number of Central American immigrants in the United States has nearly tripled. This immigrant population grew faster than any other region-of-origin population from Latin America between 2000 and 2010. Central American immigrants' share of the total immigrant population in the United States has also grown steadily for the past five decades, from less than 1 percent in 1960 to almost 8 percent in 2011. Compared to other immigrant groups in the United States, Central American immigrants were less likely to enter as refugees; more likely to obtain lawful permanent residence (LPR) status through family relationships; reported having lower levels of English proficiency and education; were more likely to live in poverty; and were more likely to be of working age. About 1.5 million children under the age of 18 resided in households with at least one Central-American born parent, representing 9 percent of all children of immigrants. This article focuses on a wide range of characteristics of Central American immigrants residing in the United States, including the population's size, geographic distribution, admission categories, and demographic and socioeconomic characteristics. Data are from the U.S. Census Bureau's 2011 American Community Survey (ACS), the 2000 Decennial Census (as well as earlier censuses), and the Department of Homeland Security's (DHS) Office of Immigration Statistics. In 2011, nearly 3.1 million Central American immigrants resided in the United States, representing close to 8 percent of all immigrants. Between 2000 and 2010, Central American immigrants were the fastest growing segment of the Latin American immigrant population. 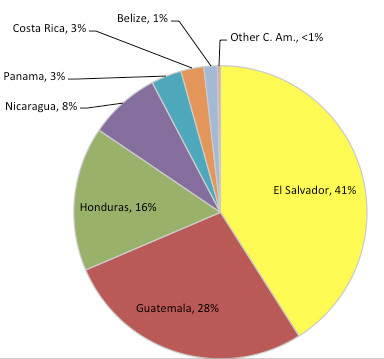 The top three countries of origin for Central American immigrants in 2011 were El Salvador, Guatemala, and Honduras. Around half of all Central American immigrants resided in three states: California, Texas, and Florida. Over one-third of all Central American-born immigrants lived in three major metropolitan areas: greater Los Angeles, New York, and Washington DC. In 2011, almost 44,000 Central American-born immigrants were granted U.S. lawful permanent residency (LPR status, also known as obtaining a green card). Central American nationals accounted for 4 percent of persons granted asylum in 2011. Nearly 34,000 Central American-born immigrants became U.S. citizens through naturalization in 2011. The share of Central American born immigrants who have naturalized (31 percent) is less than the 45 percent share of all U.S. immigrants who have naturalized. In early 2011, 14 percent of all unauthorized immigrants were from El Salvador, Guatemala, and Honduras. Central American immigrant men outnumbered women (53 percent versus 47 percent) in 2011. The foreign born from Central America were more likely to be of working age (90 percent) than the native born (63 percent) and foreign born overall (82 percent). About one-third of all Central American immigrants have strong English language skills. As a group, Central American-born adults were less likely to be university graduates (9 percent) compared to all immigrant adults (27 percent). 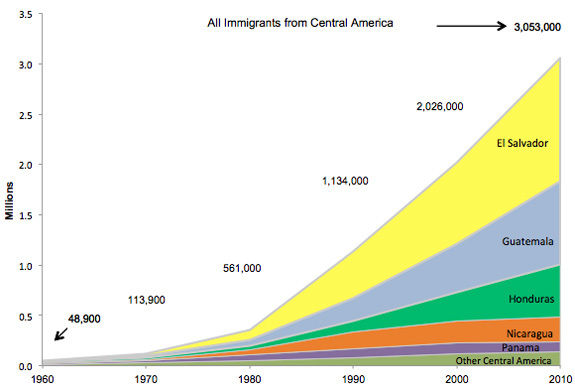 Central American-born immigrants have generally mirrored the arrival patterns of the foreign born overall. Nearly 38 percent of employed Central American-born men worked in construction, extraction, and transportation, while about 45 percent of Central American women worked in service and personal care occupations. The Central American born were more likely to live in poverty (23 percent) than the native born (15 percent) or foreign born overall (20 percent). About 1.5 million children under the age of 18 resided in a household with at least one immigrant parent born in Central America. The Central American born accounted for nearly 8 percent (3.1 million) of the country's 40.4 million immigrants in 2011. This population has grown more than 60 times its size since 1960, when about 48,900 Central American immigrants resided in the country. From 1960 to 2011, the number of Central American immigrants and their share of the U.S. immigrant population increased rapidly (see Table 1). At less than 50,000 in 1960, the population more than doubled in the 1960s, tripled in both the 1970s and 1980s, and again nearly doubled in the 1990s, reaching a 2-million mark by 2000 and then a 3-million mark by 2010. The Central-American born share of the U.S. immigrant population also increased – from less than 1 percent in 1960 to nearly 8 percent in 2010. Between 2010 and 2011, the number of immigrants from Central America remained largely unchanged. Source: U.S. Census Bureau, 1960-2000 Decennial Censuses, 2010 and 2011 American Community Surveys (ACS). Available online. The rapid growth in the population of Central American born between 1960 and 2011 has been driven in large part by increased immigration from El Salvador, Guatemala, and (more recently) Honduras. The population of immigrants born in El Salvador has grown by more than 200 times its size in 1960; the population of Guatemalan immigrants has grown by more than 150 times its size in 1960; and the population of Honduras has grown by more than 75 times its size in 1960. Increased immigration from these three countries alone accounts for 85 percent of the growth in the Central American-born population over this time period. During the 2000s, the number of Central American-born immigrants living in the United States increased from 2.0 million to 3.1 million, a growth rate of 51 percent (see Table 1). This was the fastest growth rate during this period among the foreign born from Latin America, ahead of immigrants from South America (41 percent), Mexico (28 percent), and the Caribbean (26 percent). Source: U.S. Census Bureau, 1960-2000 Decennial Censuses, 2010 ACS. Available online. In 2011, the top three countries of origin for immigrants from Central America were El Salvador (1.3 million people, or 41 percent), Guatemala (850,900, or 28 percent) and Honduras (490,600, or 16 percent). To view other countries of birth for Central American immigrants, click here. Source: U.S. Census Bureau, 2011 ACS. Available online. California hosted the largest number of Central American immigrants in 2011 (867,300, or 28 percent of the nation's 3.1 million Central American born), followed by Texas (358,000, or 12 percent) and Florida (325,200, or 11 percent). 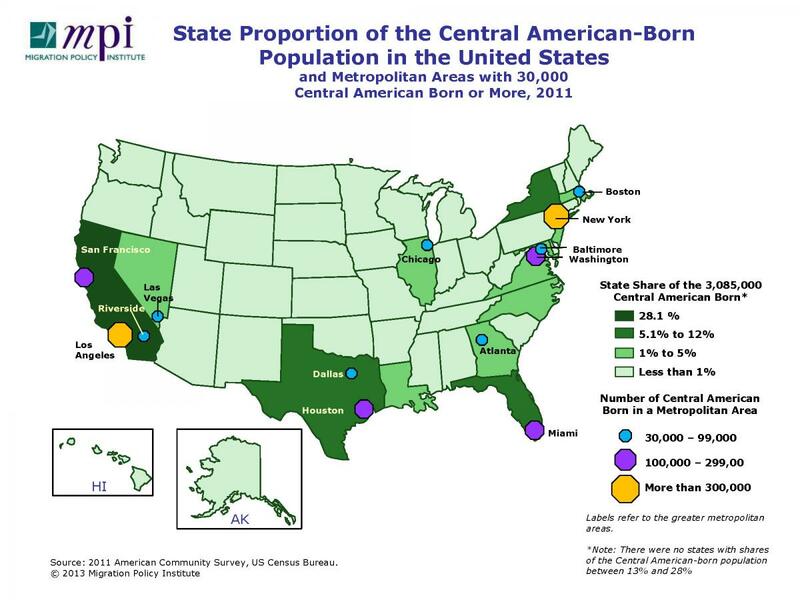 Other states with Central American-born populations greater than 100,000 were New York (257,900, or 8 percent), Maryland (155,200, or 5 percent), Virginia (152,400, or 5 percent), and New Jersey (131,700, or 4 percent). Over a third of all Central American-born immigrants lived in three major metropolitan areas: greater Los Angeles, New York, and Washington, DC. 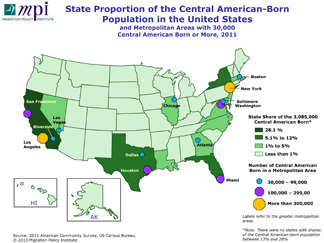 In 2011, the greater Los Angeles metropolitan area hosted the largest number of Central American immigrants, with about 575,200 (19 percent of the Central American born in the United States). The greater New York area was second with 349,800 (11 percent). The greater Washington, DC area was third with 264,600 (9 percent). Other metropolitan areas with Central American-born populations greater than 100,000 were Miami, FL (234,700, or 8 percent); Houston, TX (207,600, or 7 percent); and San Francisco, CA (103,500, or 3 percent). Moreover, Central Americans made up over 35 percent of all immigrants in the greater New Orleans, LA area (29,600 out of 84,200) and 21 percent of the total immigrant population in the greater Washington, DC area (264,600 out of 1.2 million). Note: This section is based on data from DHS, unless stated otherwise. DHS data refer to the U.S. government's fiscal year, October 1 through September 30. Thus, "2011" refers to October 1, 2010 through September 30, 2011. In 2011, 43,707 Central American immigrants obtained green cards, accounting for 4 percent of the 1.1 million immigrants granted LPR status that year. The foreign born from Central America gained LPR status mostly through family reunification. Eighty-two percent obtained green cards through family relationships, 4 percent as refugees or asylees, 3 percent through employment, and the remaining 10 percent through other routes. About 46 percent of all Central American immigrants granted LPR status in 2011 qualified as the immediate family member (spouse, unmarried child under 21, or parent) of a U.S. citizen, compared to 43 percent of all immigrants. In contrast, Central Americans were much less likely to obtain green cards through the U.S. diversity visa program compared to immigrants overall (0.2 percent versus 5 percent), or through employment-based preferences (3 percent versus 13 percent). Read more about the U.S. diversity visa program in Frequently Requested Statistics on Immigrants and Immigration in the United States. Close to 900 Central American nationals (4 percent of the total of 24,988) received asylum in 2011. From 2002 through 2011, Central American nationals accounted for 3 percent (9,014) of the 260,951 individuals granted asylum. Guatemala was by far the leading country of origin for Central American nationals granted asylum during this time with 4,700 (52 percent of all Central American asylum grants), followed by El Salvador (3,175, or 35 percent). Between 2002 and 2011, virtually no Central American nationals arrived in the United States as refugees: A total of 25 Central Americans (all from Honduras) entered as refugees during this period, accounting for less than half a percent of the 515,350 admitted refugees. Read more about Refugees and Asylees in the United States. In 2011, 33,784 Central American-born immigrants were naturalized in the United States, representing nearly 5 percent of the 694,193 new U.S. citizens. The Central American countries of birth with the most naturalizations were El Salvador (13,834), Guatemala (7,285), and Nicaragua (5,092). The share of Central American born immigrants who have naturalized (31 percent) is less than that of the overall foreign-born population. According to 2011 ACS, about 31 percent of Central American immigrants were naturalized U.S. citizens, which is less than the estimated share among all immigrants(45 percent). In 2011, 68 percent of immigrants born in Panama were naturalized U.S. citizens, making them the most likely of all Central American immigrants to naturalize. Immigrants from Belize (58 percent) and Nicaragua (53 percent) were also more likely to be U.S. citizens than those from other Central American groups. The naturalized as a share of the total immigrant population were comparatively lower for El Salvador (30 percent), Guatemala (24 percent), and Honduras (23 percent). Of the approximately 11.5 million unauthorized migrants in January 2011, the DHS Office of Immigration Statistics has estimated that 6 percent (660,000) were born in El Salvador, 5 percent (520,000) in Guatemala, and 3 percent (380,000) in Honduras. For more information, see the DHS Office of Immigration Statistics' Estimates of the Unauthorized Immigrant Population Residing in the United States: January 2011. Of all Central American immigrants residing in the United States in 2011, 53 percent were men and 47 percent women. By contrast, gender distributions were more balanced among the native born and overall foreign born (about 51 percent female and 49 percent male for each population). The gender imbalance among Central American immigrants was most pronounced among immigrants born in Guatemala (59 percent men). However, in 2011, women outnumbered men in the populations of immigrants born in most other Central American countries. The tilt toward women was most pronounced for immigrants born in Panama (64 percent women), Belize (60 percent), Nicaragua (55 percent), and Costa Rica (53 percent). Of the Central American born residing in the United States in 2011, 90 percent were working age (16 through 64 years old), compared with 63 percent of the native born and 82 percent of all immigrants. Among Central American immigrants, only 6 percent were older than 64, compared to 13 percent of the native- and foreign-born populations. Central American countries with the highest share of immigrants of working age in 2011 were Honduras (92 percent), El Salvador (91 percent), and Guatemala (90 percent). Central American countries with the highest shares of seniors were Panama (22 percent), Belize (16 percent), and Nicaragua (12 percent). In 2011, 7 percent of Central American immigrants ages 5 and older reported speaking only English, and 26 percent reported speaking English "very well." In contrast, 16 percent of all Central American immigrants reported not speaking English at all; 22 percent reported speaking English "well;" and 29 percent reported speaking English, but "not well." Overall, about 67 percent of Central American immigrants were Limited English Proficient (LEP), meaning that they reported speaking English less than "very well." In contrast, 51 percent of all immigrants reported limited English proficiency in 2011. Rates of English proficiency varied by Central American country of origin. Those from Guatemala were most likely to be LEP individuals (74 percent), followed by those from El Salvador (72 percent), Honduras (69 percent), and Nicaragua (55 percent). The highest rates of English proficiency (speaking only English or speaking English "very well") for Central American immigrants occurred among those from Belize (95 percent), Panama (73 percent), and Costa Rica (61 percent). Note: In the ACS, respondents who reported that they spoke a language other than English at home were asked to self-assess their English-speaking abilities with the options of "not at all," "not well," or "well," and "very well." In 2011, only 9 percent of Central American-born adults ages 25 and older had a bachelor's degree or higher, which is substantially lower than the 27 percent share of immigrant adults and the 29 percent of all U.S.-born adults. In addition, 50 percent of Central American-born adults had no high school or GED diploma, compared to 31 percent of immigrants overall and 11 percent of native-born adults. The share of the Central American born who reported their highest educational attainment as a high school diploma, some college credits, or an associate's degree (41 percent) was lower than that of the native born (61 percent), and equal to the foreign born overall. Levels of educational attainment vary among Central American origin countries. The top Central American origin countries from which immigrant adults reported having a bachelor's degree or higher were Panama (27 percent) and Costa Rica (23 percent). Yet over half of immigrants from Guatemala (59 percent), El Salvador (55 percent), and Honduras (52 percent) lacked a high school diploma. As of 2011, approximately 39 percent of the 3.1 million Central American immigrants in the United States had entered since 2000; 26 percent between 1990 and 1999; 24 percent between 1980 and 1989; and 11 percent prior to 1980. This arrival pattern generally mirrored that of immigrants in the United States overall with some small variation in earlier years: 36 percent had arrived since 2000; 27 percent arrived between 1990 and 1999; 18 percent entered between 1980 and 1989; and 19 percent entered prior to 1980. While some Central American origin groups were more established than others, most had arrived prior to 2000. In 2011, immigrants from Panama (59 percent), Nicaragua (59 percent), and Belize (58 percent) were most likely to have arrived before 1990. Relative to other Central American origin groups, immigrants from Honduras (50 percent) and Guatemala (49 percent) were more likely to have arrived after 2000. Central American-born male workers appear to be more highly concentrated in a few occupational groups than immigrant men of working age overall (see Table 2). The top three occupational groups employed 80 percent of the 1.2 million Central American-born male workers ages 16 to 64, including 38 percent in construction, extraction, and transportation; 26 percent in service and personal care; and 16 percent in manufacturing, installation, and repair. In contrast, while the same three occupational groups were the top three for immigrant men overall, they employed only 57 percent of the 12.9 million immigrant male workers. Among the 758,000 Central American-born female workers ages 16 to 64, 45 percent reported working in service and personal care occupations; 12 percent in administrative support; and 10 percent in manufacturing, installation and repair. The top three occupations groups for the 9.6 million immigrant women were somewhat different: 27 percent in service and personal care; 13 percent in administrative support; and 11 percent in management, business, financial occupations. Source: Authors' analysis of U.S. Census Bureau 2011 ACS data. Because over two-thirds of Central American born living in the United States are from El Salvador and Guatemala, trends in occupation statistics for all Central American immigrants appear biased toward the trends of immigrants from these two origins. Occupation statistics for immigrants from the other Central American countries often vary from the regional trends. For example, among immigrants born in Panama, only 15 percent of men work in construction, extraction, and transportation, while only 21 percent of women work in service and personal care. In 2011, a larger share of Central American immigrants (23 percent) lived in households with an annual income below the official federal poverty line than among the native born (15 percent) and immigrants overall (20 percent). The share of the immigrant population living in poverty varied significantly between origin countries. For example, immigrants from Panama (15 percent), Costa Rica (16 percent), Nicaragua (17 percent), and Belize (19 percent) were less likely than immigrants overall to live below the federal poverty line. In contrast, immigrants from Honduras (30 percent) and Guatemala (27 percent) were more likely than other immigrants overall to live below the poverty line. Approximately 1.5 million children resided with at least one Central American-born parent in 2011, representing 9 percent of the overall population of children from immigrant households (17.1 million children). Similar to the latter population, the vast majority of children in Central American immigrant households were born in the United States (about 87 percent for all immigrant families, and 91 percent of those in Central American immigrant families). Note: Includes only children who reside with at least one parent who is foreign born. Excludes families with U.S.-born parents with foreign-born adopted children.